The National Endowment for the Humanities (NEH) has published a piece on “New Mexico, New Spain, Old Cultures: Historic Spanish-Language Newspapers in Chronicling America” which covers some of the great content and historical context of Spanish- Language newspapers in Chronicling America. 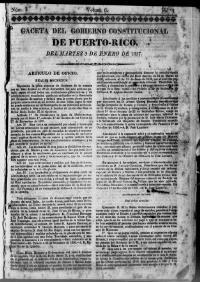 One of the featured titles is Gazeta de Puerto Rico (San Juan, Puerto Rico), which was digitized thanks to the University of Puerto Rico and University of Florida, working together on the Florida and Puerto Rico Newspaper Project and the Digital Library of the Caribbean (dLOC). It’s great to see this story promote the awesome collections and work being done for Chronicling America! Also, check out the Digital Library of the Caribbean (dLOC) for more great content from and about Puerto Rico!